The guest apartment we stayed in on our time away last week has a brick wall in the dining room and kitchen. It also has great light! I just had to take some photos with the brick wall as a background. so I made do with some fruit we had for snacking on and a bowl from the kitchen. Boy, do I love that wall! Two years ago we took our oldest granddaughter and stayed in the same apartment. I took this photo of her in front of that same wall. It'd be so cool to have a brick wall as an accent wall. I'd love that!! I wish I could have transported that wall and that great light home with me! Wonderful backdrop. 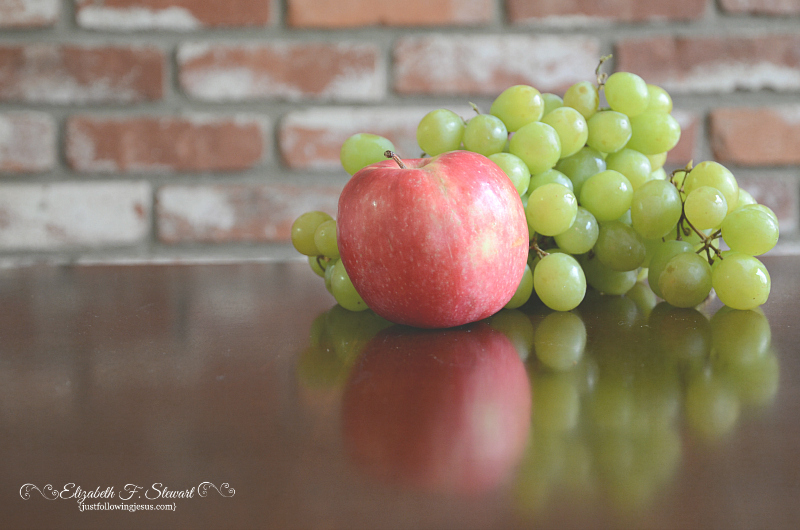 Amazing what you did with just some fruit, a bowl and a brick backdrop! I'm regretting not signing up for Be Still, yet know, with all that's going on right now in my life, such as my daughter's upcoming wedding, I probably would not have time to do it justice. A great backdrop love your Granddaughter . Ahhh, the reflection in the table in that second one - so lovely! And while shooting it, I didn't notice the reflection in the table all that much. More luck than skill I guess! 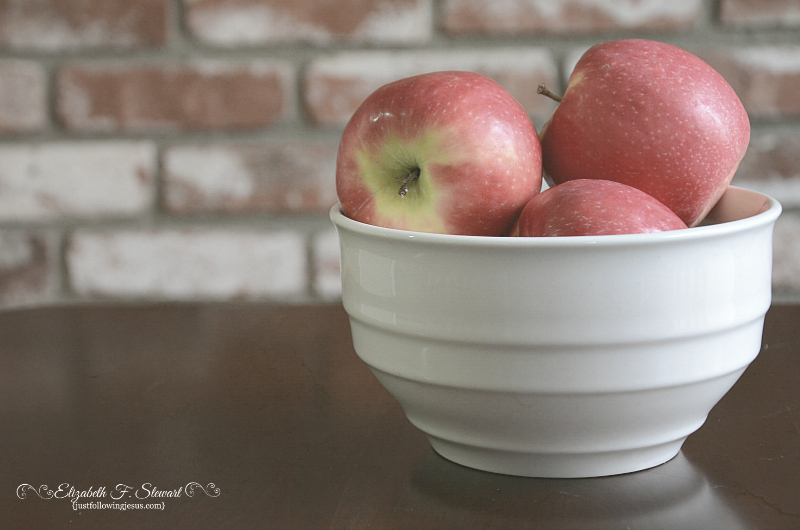 I always love to see photos of apples and a brick wall is always a great background. Sarah, I love photos of fruit and food photography in general is one of my favs. Thanks for your kind comment! I second the ahhh over that reflection! Lovely work, Elizabeth! Love that brick wall! I turned to fruit this month too. I'll be sharing on the blog in a few weeks. Such beautiful images! LOVE the brick! You are so very talented.....in more ways than one. 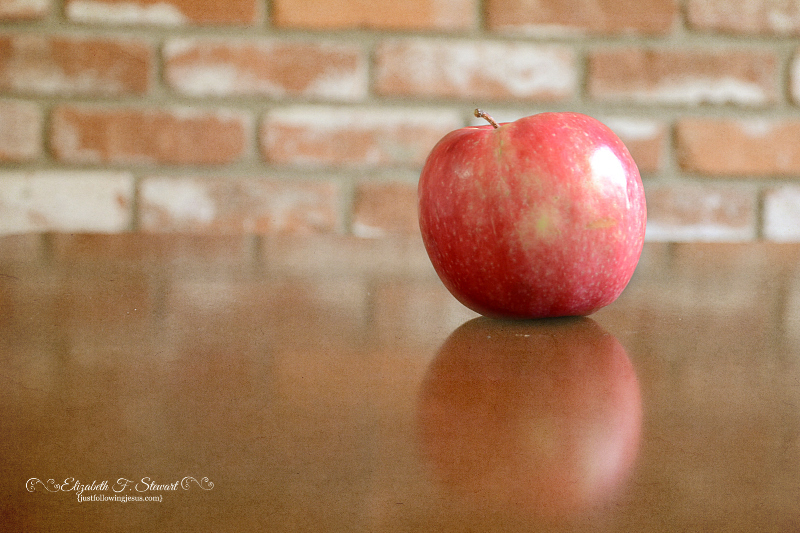 Love the brick background and the beautiful reflection you have capture...makes the apples stand out..
Nancy, I definitely don't have this great light at my house, nor the wonderful brick wall! Lovely images and a beautiful granddaughter! Thank you so much! I think she's pretty wonderful, too! Lovely photographs, Elizabeth. What kind of camera do you work with? Dayle, I have a Nikon D7000. At the top of my blog there's a link tab that shows you my camera and various lenses. Yes, that's a great background, with the reds that complement the red apples. And your granddaughter is adorable. Love her whimsical expression! Sharon, I love this photo of my granddaughter, too. 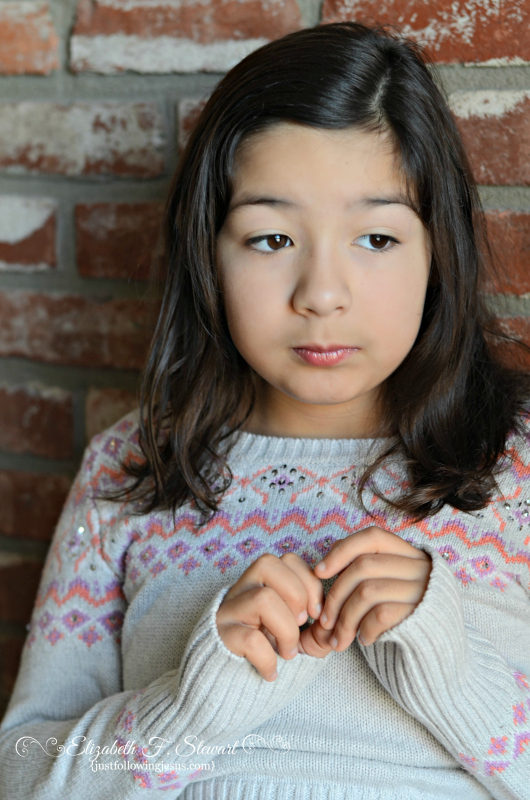 She's two years older and already lost much of the little girl look that this photo still has. Wonderful. Love the reflections in the table top. And, the red brick, red apples, and green grapes . . . very nicely done.